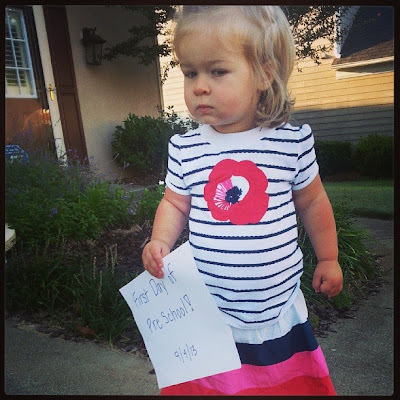 The Buerglers: Evie's First Day of School! Last year we were abundantly blessed with a nanny-share with one of my co-workers. It was ideal and fantastic. The kids were well attended to and in the comfort of someone's home. With the other mom having her third this summer and the nanny needing a little more lucrative work, we parted ways. Eric and I were hoping to recreate that in-home nanny experience for Evie this Fall. We had a college girl nanny this summer, and then a friend of my sister's was lined up to watch Evie from August through December. Unfortunately for us, fortunately for her, she landed a dream job to start in early September. After only a month I had to scramble to find something. Thanks be to God, as I was driving to work one day I saw a little church post a sign that they still had openings in their Mom's Morning Out program. Quick Google search landed me the details I needed: the right location, the right days, the right hours, and the right price. I called around to a few other programs to see if they had openings but this church still had the best combination of things we were looking for. So we went for it! I went on a tour with Evie and it was perfect. It's small, play based, and exactly what she needs! After meeting Evie they invited her to register for the 2 year old class since she's old for her grade, and this year's 2yo class is young for their age. I think it's going to be a perfect fit. Today was her first day and she did GREAT! 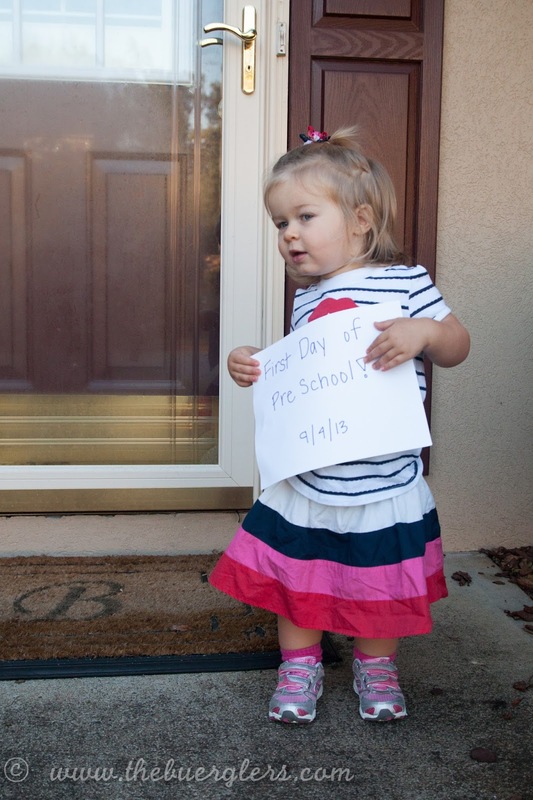 A little apprehensive this morning getting ready and taking pictures, but the second she walked in her classroom she gave the teachers her infamous "hey" wave and took off for the "house" center. The teacher said she did really well today. They colored, played on the playground and spent a good bit of time just playing with their new friends in their centers. She already brought home some art work. No sooner we were out of the parking lot was she out! 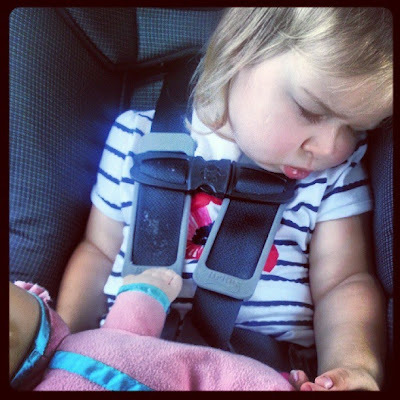 We'll see what school and car naps do for her nap/sleep routines.